I have made this necklace with rondell shaped beads measuring 8 x 4mm each. 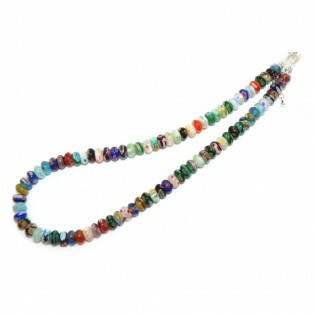 I have added a bead cap to each end and then strung a white opal 4mm Swarovsli bicone bead at each end too. The necklace measures 43cm (17") long but I have also added a 4cm extension chain so that it can be worn longer. The silver plated clasp and extension chain are "Nickel Free" to comply with EU Regulations.